DAVID AND BATHSHEBA—–intelligently written and well acted, this 1951 Biblical story is more thoughtful and sober-minded than many that make up the spear & sandal set. In trying to sidestep the hoke that layered DeMille’s Samson And Delilah a few years previously, and letting MGM’s same-year colossus Quo Vadis tackle the size-prize, the Fox honchos gave this a restrained tone, with little in the way of action. 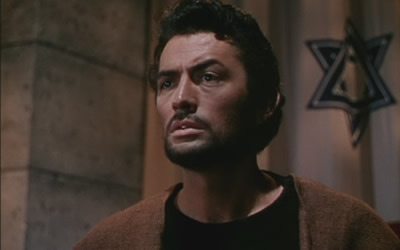 The downplayed handling doesn’t produce much in the way of excitement over the 116 minutes, so, along with the technical attributes, most of the holding power stems from the finely modulated performance from Gregory Peck as David, who admirably wrestles with the interwoven dilemmas of leadership and strength, desire and weakness. Susan Hayward as Bathsheba is not bad, much less extravagant with her emoting than she was would be in Demetrius and the Gladiators (let alone The Conqueror). Her adulteress is seductive enough, if perhaps rather more suggestive of Palm Springs than any other oasis. The rich Technicolor lensing (Leon Shamroy), sensitive scoring (Alfred Newman), fine sets provided by the art directors and the colorful costume design all drew Oscar consideration, as did the screenplay (Philip Dunne), though none took home the awards. They do keep the movie looking and sounding good, even as the lack of action holds it in second gear. Gwen Verdon scamps as an exotic dancer in one brief scene. 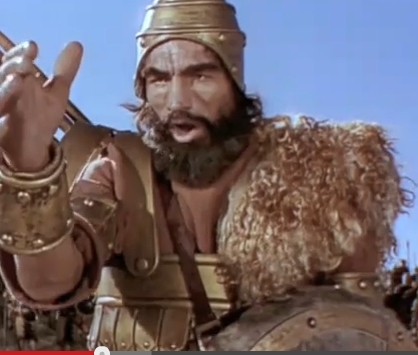 A seven-foot-two wrestler named Walter Talun geared up as Goliath (bonk!). The studio’s $2,170,000 investment paid off handsomely with $13,500,000 in grosses, #5 for the year (Quo Vadis way out in front at #1). Co-starring Raymond Massey, Kieron Moore, James Robertson Justice, Jayne Meadows, John Sutton, Francis X. Bushman and George Zucco. Henry King directed, filming on location outside Nogales, Arizona. Watch out for that rock! Oy!! !